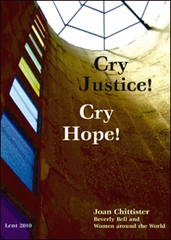 Take a journey this Lent with women around the world whose very lives Cry Justice, Cry Hope. Through the skillful interviews of Beverly Bell, meet women in Nigeria, Philippines, Haiti, Brazil, India, United States, and Mali, whose stories will amaze and inspire. Each week of Lent, Joan Chittister reflects on one of the women’s stories in light of the Sunday Scripture and invites you to contemplate the impact on your own spirituality. She poses the question: “Why would anyone take on such difficulties, not only for the sake of their own lives, but for the sake of others as well?” In your answer to this question, she writes, is the very meaning of both Lent and life.